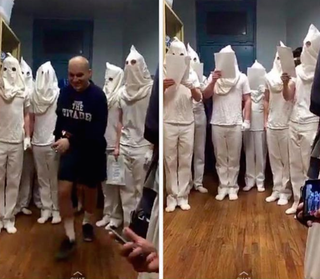 Eight cadets at South Carolina's Citadel have been suspended after photos spread throughout social media showing them in white, Ku Klux Klan-style hoods and singing Christmas carols, WCIV reports. In a statement by Lt. Gen. John Rosa, the cadets were said to have been singing the carols as part of a "ghosts of Christmas past" skit. "These images are not consistent with our core values of honor, duty and respect," Rosa said in the Facebook post. Rosa added that suspension proceedings immediately began for those cadets, including one upper-class cadet, and an investigation is ongoing. A social media post Wednesday detailed how one young woman was approached on several social media platforms by an unknown young man who told her, "I always wanted a black girl." The young woman said that she stopped replying to his posts, but when she went to her Snapchat to see if she could see his story on her feed, she saw the photos and videos of the cadets singing and laughing. "I screenshotted and decided to share because I was so offended," she said, according to WCIV. "Was this their idea of some kind of joke?" According to WCIV, in a Facebook post, the girl was "threatened, harassed and offered money" from cadets in an attempt to keep the pictures offline so as to not "ruin their lives." The guy reportedly told her that they were only joking, and asked her to remove the post, which she did because she was scared. However, she later reposted it, thinking that it was important for others to see the photos. Some believe that the stunt was some sort of hazing.